This project is all about reusing "throw- a -way" items and re purposing them into something useful. 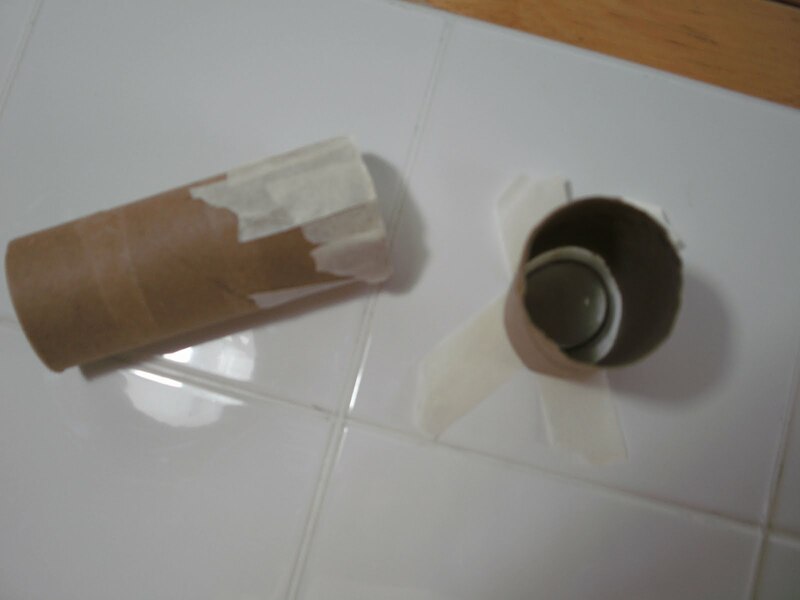 Here I used the cardboard paper towel roll. 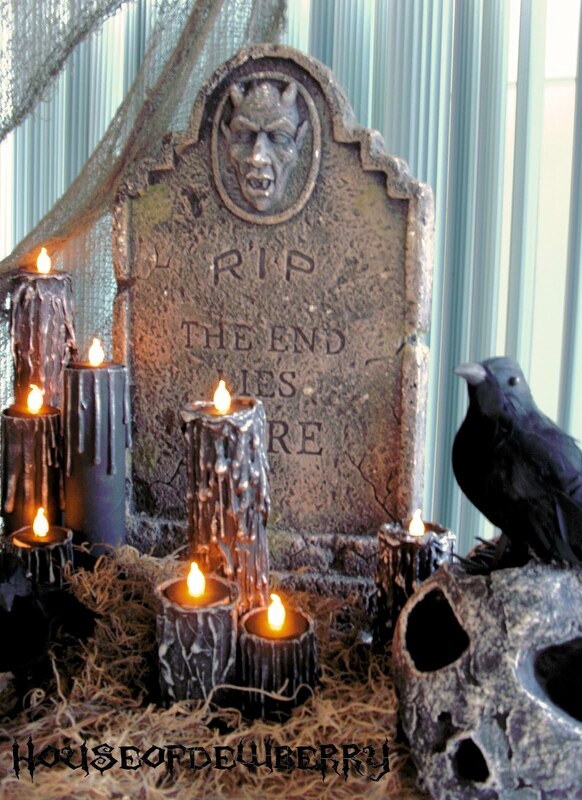 Something one would normally just throw away can easily be re-purposed into a creative, inexpensive, easy, Halloween decoration or prop. 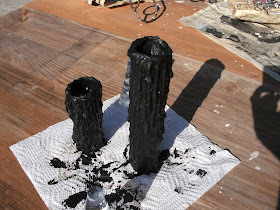 I remembered a how-to I came across in which one created Halloween candles using PVC pipe. I loved the idea and had every intention of doing just that until I remembered I didn't have any PVC, although, I did have a paper towel roll! I really hadn't any idea if it would work just thought I would try anyway. It replaced the PVC perfectly and for the candle flame I used a tea light! 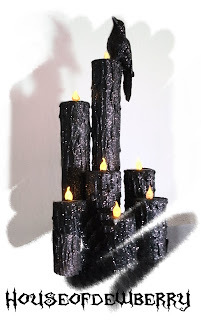 Because the candles are made from a light weight paper towel roll the top of the candle will have most of it's weight to carry from the glue, therefore, making it top heavy, which can make it tip over easily. I glued glass pebbles that I had left over from another project to the bottom of my candles to weight it down. You can use anything that will fit into the bottom end of your roll, small rock, bolt, etc, anything that is safe and will give it some weight. Here is how I used the glass pebbles. I lay the glass pebble on the sticky side of my masking tape and then tape it to the bottom of my roll. You can also let the glue slip down onto wax paper the peel the paper off leaving the flatted glue, this will help balance the candle as well. 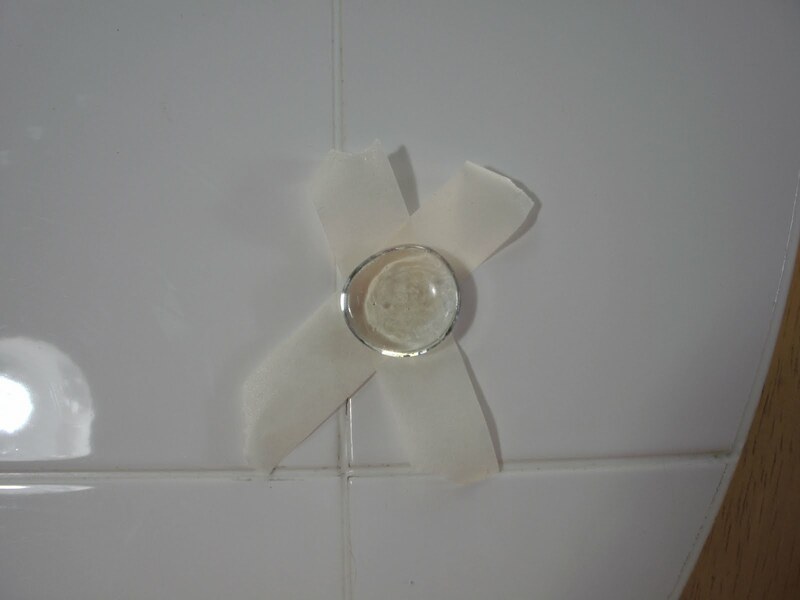 For the top I take the masking tape and "sticky side" down I place the tealight on it then push the tealight and tape down into the top of the roll, I do this three or four times until the top invert is covered. This will give support for the tealight to sit down into the top of the candle. 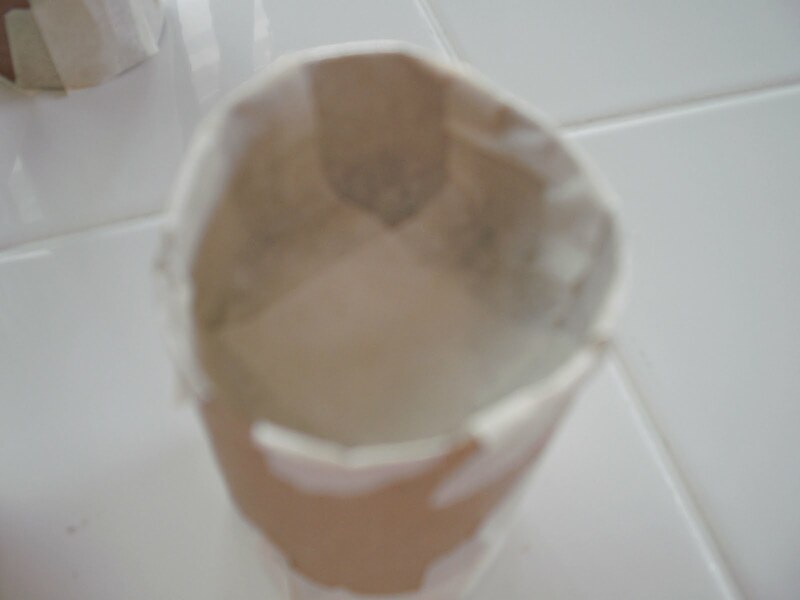 It should look like this once you are finished with the tape. The tealight should fit easily down into the support and be flush with the top of the roll. Sorry for the blurry pic. Now that you have the top and bottom done remove the tealight. You are ready to make the dripping wax part of the candle. 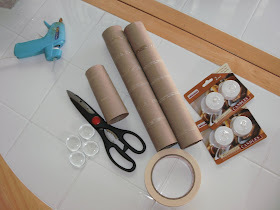 To do this take your heated glue gun and place it up at the top ridge of the roll then squeeze the the trigger and let the glue slip down the side of the roll. 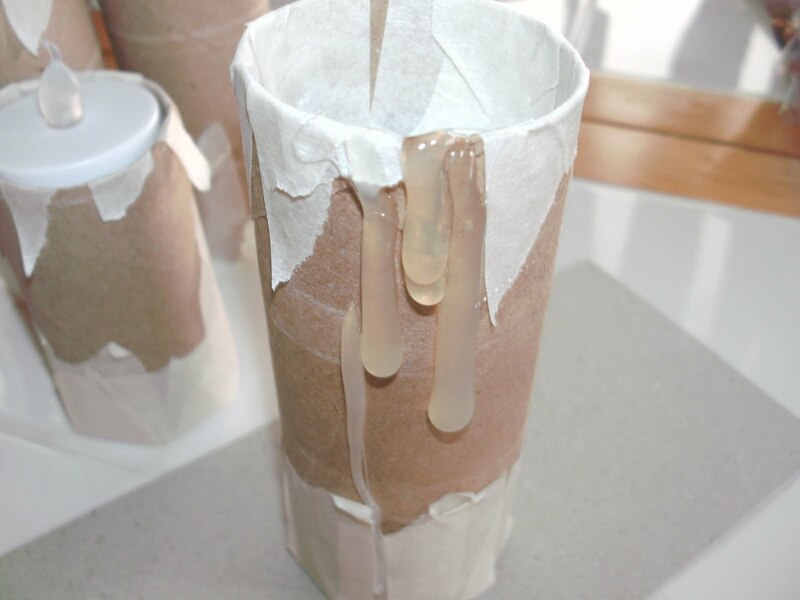 Do this over and over letting the glue act like the dripping wax. 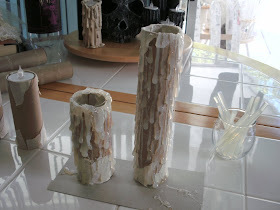 Here you can be as creative as you wish, if you like a really drippy candle then add a lot of glue drips, if you just want a few drips as if the candle has not been lit long then only drip a few. It is completely up to you. Once you are done with this part you are ready to paint it. 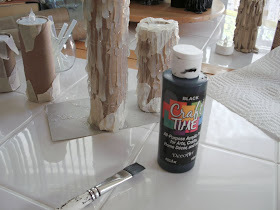 Inexpensive acrylic craft paint is my choice for this project, however, you can also use spray paint. I find brush on less messy. I give it a healthy coating of paint then set it out to dry. Once the black is dry, I take white paint and a soft brush if you do not have a soft paint brush handy, and you don't feel like running to the nearest paint store you can use a large make up brush for applying this part. The brush just needs to be soft. Take your white paint and lightly brush it against the candle this will highlight the raised parts of the candle giving a two tone effect and add definition to the drips. Now you can paint the top of your tealight to match the candle color or leave it white it is up to you the creator. The decorating possibility using these home made paper candles are endless they can be used anywhere.Here is a picture of a table display I used some of my candles in. easily be expanded on when imagination is applied the possibilities are endless! this looks sooo easy I think I can do this! what great directions!!!! and it's going to make my house look sooooo awesome for halloween. I can't wait to do this project with my kids. ps I'm not artistic and I think I can do this project!!!! Sherry, Excellent!! So cool!! I think you could do them for Christmas too! In reds and greens! You've got my mind going! Thanks!!! Xmas! Then you will love the glitter ones I will have up next weekend, they are... well very sparkly! Thanks Magic! That is great Anonymous, I would really like it if you could let me know how they come out! Enjoy and have fun! I may just have to give these a try this Halloween! These are absolutely AMAZING! I am so impressed. Thank you so much for sharing and I am so excited to try this, just pinned it. Thanks for sharing! I just made 4 and I love them! It was so easy and fun to do :) I am a new follower! Thanks Priscilla! Are you going to post the candles on your blog? It would be so much fun to see them. They always come out so great and they are so easy! Thanks for visiting. Thanks Sammie for the Pin! This is a GREAT idea! I love love love it! Definitely going to make some of these to place around my "Spell Book". Thanks for sharing. Hey there, I just wanted to let you know that we featured your candles on our site today. I attempted to re create these candles and linked back our inspiration to you :) Thanks for the great idea!! Great use of materials! Thanks for linking up to The "Autumn Décor" Talent Scouting Party at WhisperWood Cottage! I am soooo going to make this today!!! I already have so many projects going but I can't wait. These are so awesome! Thanks for sharing. Made mine and I love them. I used gold metallic paint instead of the white but I think they look really cool. I may have to make some more. I would love to see your candles, is there a link or a picture you can share? I am so happy that you tried them out, they make a great prop for Halloween! Make more! You can never have too many candles! Have fun Dannee and thanks for stopping by and sharing with me that you were successful in making your own! Working on a set for a Halloween bachelor(ett) party, so far ez, thanks. Give treats to your loving once with Halloween chocolates. Love these, however how are you doing the ones with the graphic paper? how are you getting the "wax" white? I paint the glue, which in your comment you referred to as wax, (just wanted to clarify that in case you are knew to this) it is hot glue that I use to make the wax effect. Then I use white craft paint with a small brush and paint it. Thank you, if you have anymore questions feel free. Oh these are fantastic! A definite 'must try"! I'll be told plenty of new stuff right right here! Best of luck for the following! is genuinely good, all can easily be aware of it, Thanks a lot. Are these pretty sturdy? Do they last year after year? Hi Alyson, Yes they are very durable, they can last a very long time. Do they need to be secured or will they stand up ok as is? Making them this weekend so excited! Not sure if you have made them yet? 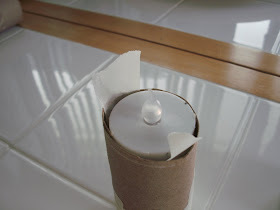 However, if you place the cardboard tube on wax paper, then let some of the glue melt down the tube and onto the paper on all sides of the candle, let it cool then tear off the paper. They will be steady and not tip over. Hope that helps. Have fun! Hi, how would you do the "glitter" versions of this? 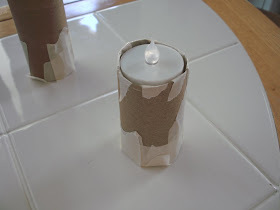 The same way you make these, when done you coat the candle with white glue and pour the glitter on! 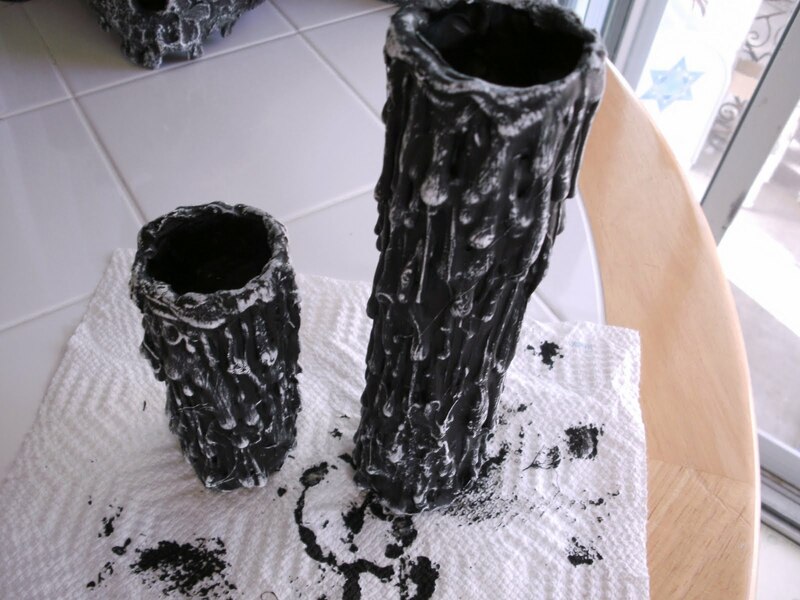 You can create a design by just painting some of the drips. Have fun! Thank you! I have them all made up, just need to paint and glitter!! That is terrific! Would love to see a picture! Happy creating! Hey there! Is there a certain glue gun you've used? Tried this. It for some reason my glue just won't drip. :( I have to glue down in a line and it just doesn't give off the same effect. These are so awesome, my kids want to make them for their rooms! Thanks Lorena for answering the question! Right now I am using a glue gun I picked up from Walmart nothing special. It's an AD tech 2 temp. I go though guns fairly fast so when one goes out I get whatever I can find. It sounds like you may need a new one. The glue should flow effortlessly out of the gun. Hope this helps! Hi, Just wondering how you made the tree branches? How did you form them? Leftover paper towel rolls twisted up? Brown bag? I might have missed that. Just did my first candle, most steps done, but I need to go play with the kids for a bit. OMG ur a genius! You made something that looks so complicated and intricate from something as simple as paper towel rolls and hot glue. I wish I could be as inventive. Thank you for making this accessible. NIce job! Well done. Great instructions and easy to follow I can't wait to try these. Thank you! I bet yours will come out great! CollettesTreasures is my lightside, Vintage, Repurposed, Reused and Upcycled. HouseofDewberry is my dark side Halloween enthusiast,paper Mache,clay,mixed media, art and sculpture a bit of light and dark.